Daisy (left) is 29, Leah (right) is 27. They are co-founders of The Hardihood. 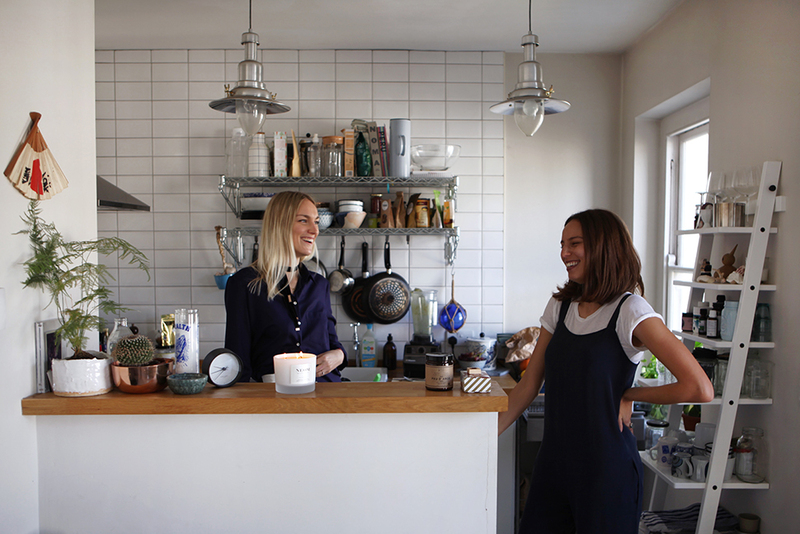 They make raw cakes, all day, everyday – using natural ingredients to create cake that is nourishing as well as delicious & aesthetically exciting. Their products are free-from refined sugar, gluten, dairy & soy. In case you’re thinking that raw somehow means boring, you are very wrong – they’re adamant that everything they make is as abundant & decadent as the naughtiest dessert you’ve ever laid eyes on. Having tried almost every single type & flavour of cake they’ve ever made, we can assure you that these guys are the best out there. Leah is wearing our MAN REPELLER jumpsuit with a Reformation tee and shoes from Topshop. Her rings are made by her good friend Gabrielle Coulter. Choker that she made herself. Earrings from Spitalfields Market. Daisy is wearing our navy BLAKE shirt & white RIVIERA skirt with Birkenstocks. Choker from Are You Am I. Earrings by Rebekka Rebekka Copenhagen. Antique 1920s engagement ring – bought in the Brighton Lanes. Black ring bought in Japan. Herbs, Crystals, Mystics, what’s not to love? We drove past this place so many times in LA before we realised it was actually open. Stock up on everything you need for a spot of white brujera, single handedly the reason I had to plead with the BA lady not to charge me for my heavy luggage at the airport. For introducing me to the most fabulous eco-friendly loo I’ve ever seen. Casita Verde will always have a special place in my heart. An eco-education centre, showcasing sustainable living and alternative energies. You need to drive for miles up a dirt track to get to this place, it’s surrounded by mature cacti and aloe vera and the walls are made from clay and collected glass bottles. I love it. Sundays sessions are best and their fresh aloe vera juice is unbeatable. Modern cosmic thinking for the now age. I turn to The Numinous whenever I want to believe in magic. A platform for the material girl in a mystical world. Founder Ruby Warrington hits the nail on the head every time – Moon Juice, Astrostyle, Gabrielle Bernstein, Fine & Raw Chocolate, Jody Shield, spirit animals… I heard it here first. If you’re into flea markets & trinkets like me, then this is an antique haven. A small drive out of the city centre, on Amager, this rickety old shed is filled with antique Scandinavian homeware. You’ll find Royal Copenhagen, classic Danish Design furniture and ceiling-high piles of glassware & ceramics. A stunning new annual journal that will change location for each issue. Beautifully documenting landscapes and urban spaces, they interview local creatives and artists to see how the spaces that we live in influence our work. The first issue is centred around California – with breathtaking visuals of desserts and dwellings, you’ll want to move immediately. If you’re planning a Japanese trip sometime soon then don’t overlook the country’s stunning southern islands in the Okinawa prefecture. I traveled to Ishigaki island, 3 hours by plane from Osaka and found myself in pure white sandy-beach paradise. With a lovely sense of laid-back island living, it was the perfect getaway from my big-city getaway.